The book started really slow and I was thinking about quitting but at halfway through it changed when things started to happen. I’m glad I kept reading because the latter part was really good. We follow Margot from her childhood when she joins the court of her brother Charles IX to St. Bartholomew’s Day Massacre. During that time, she learns to get less innocent and learn to stand up to herself. My biggest problem, especially at the start, was Margot. I didn’t like her and she was just too naïve. 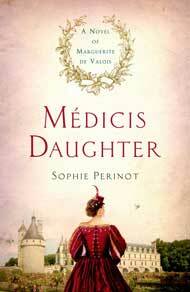 How Catherine de Médici could have such a naïve daughter is a wonder. She did got more likeable towards the end but for some reason I never really warmed up for her. However, I did like how everyone else was presented in the book. Since books usually focus on Catherine de Médici, it was especially interesting to see her through the eyes of her daughter. This book doesn’t cover her whole life, and I was left wondering how Perinot would have covered her later life. This was my first book by the author and now I’m more curious to read The Sister Queens which I own. I like the book cover and the premise of the story sounds interesting. However, I’m not sure it’s something I’ll pick up. I hope you enjoy the next novel!